Fishing is extremely popular throughout the summer months; however, it is also done during the winter. There are a few differences you should know about. Ice fishing can be split into three methods. The first method uses a small, light fishing rod with small, brightly coloured lures or jigs. The lure is baited, often with minnows. The angler sits at the hole in the ice and lifts the pole every now and then, bobbing the line. The angler can also make use of a tip-up, which are made of wood or plastic, and have a spool of line attached, with a thin piece of metal that goes from the spool to the flag. Black line is put on the spool and a swivel is placed at the end of the black line. Then a piece of fishing line with a hook is attached to the swivel. The hook with bait is placed into the water under the ice. When the fish strikes the bait the flag is lifted which notifies the angler that he has a fish on the hook. The angler pulls the line in and the fish fights. The angler will allow the line to slip through his hands during the struggle. When the angler can get the fish's head into the hole in the ice, the fish is quickly lifted onto the ice. Finally an angler can use a technique that calls for a large hole in the ice. A fish decoys may be deployed. The angler then peers into the water while holding a large spear. The fisherman waits for fish to appear, then plunges the spear into the water. Ice fishing was first employed by First Nations and other subarctic/arctic cultures around the globe. The Ojibwa used ice chisels to chip holes in the ice. Early on they employed the spear fishing technique. They also constructed rods as well. Soon the First Nations perfected the jig and net technique, which ultimately changed the way they fished. It allowed them to catch a great deal of fish in a small time. It also allowed them to set the net and perform other activities, pulling the net up at their convenience. This practice is still employed by First Nations today. The modern style fishing rod with reel didn’t become common place until 1770. When it finally did it changed the way fishing was done all over the world. Fishing line changed from hair and plant fibers to silk and eventually to monofilament. As ice fishing became more popular in the 1900’s, the size of the ice fishing rod was reduced. It allowed the angler to both reel in the fish and look into the hole at the same time. Another improvement in ice fishing occurred with the invention of the threaded ice auger. 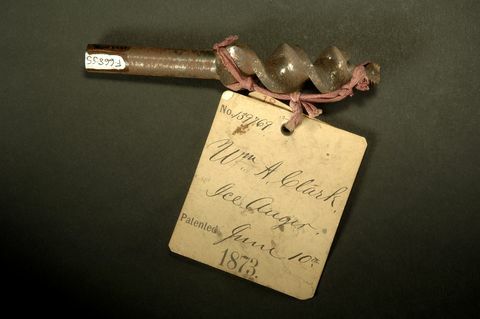 In 1873, William A. Clark of the United States received a patent for an auger to bore holes in ice. Prior models were slow and grinded down the ice. Clark’s model allowed the auger to expel the ice easily. His auger reduced the effort of drilling and was much easier than making a hole by ice chisel. Jiffy power augur was developed in 1948 and was widely available by 1951. The power auger which allowed anglers to drill through the ice in seconds meant that it was possible to drill multiple holes and spend more time fishing. The Beaver Dam Tip-up was developed in the 1930s and allowed anglers to maintain multiple holes at once. More recently, in the 1980s, a man by the name of Dave Genz invented the first pop up tent style portable fish house. What used to take precious minutes or hours now took 30 seconds. Modern day anglers sometimes use portable battery powered depth finders. These depth finders can produce graphs and indicate fish by sonar. Some anglers even have underwater cameras to locate fish. These cameras help to locate fish and tell anglers when to set the hook. Using a GPS an angler can locate their favourite fishing spots with precise accuracy and also use mapping software to help locate potential fishing holes. These techniques have changed ice fishing from a means of survival to a relaxing sport.